Mr Kerneels Grundling (GM of PPC mine), Mrs Nolwandle Mantashe(PPC Executive & Government Relations) and Mayor Patricia Mosito of Thabazimbi during the Dwaalboom borehole handing over. 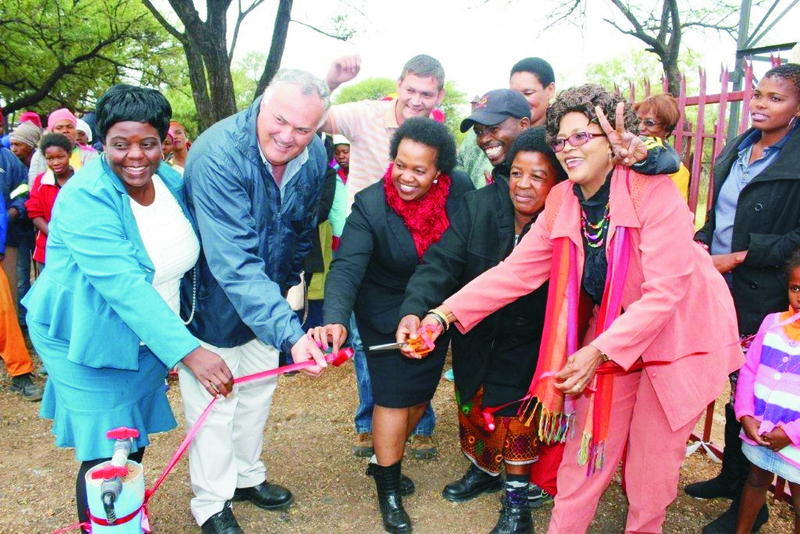 DWAALBOOM – The communities of Skierlik and Dwaalboom informal settlements in Thabazimbi Local Municipality areas have been urged to take care of its renovated boreholes. The Mayor appealed to residents to guard the boreholes. Mayor Mosito said: “The boreholes are yours so please take good care of them. Report any wrong doing and anyone who vandalise or steal from the boreholes”. “Today we are delivering what human nature needs, water. It is important to know that PPC has a number of good relationships with communities “said Mrs Nolwandle Mantashe, PPC Executive and Government Relations. The Mayor thanked Department of DMR, PPC mine and CCP Handelaars for their good gestures. The handover was attended by councillors, Management of PPC mine and community members.